How Many Seeds Are In Your Pumpkin? content words: Happy Jack, Big Max, Jack B. 1 A pumpkin is a type of squash. It starts out as a seed. Two tiny leaves pop out of the ground. Then a vine starts to grow. Large yellow flowers begin to bloom as the vine gets longer. Bees pollinate the flowers. Tiny green pumpkins begin to form at the base of the flower. These small, round fruits will grow into pumpkins of all sizes. 2 Most pumpkins start out green. They begin to turn orange as they ripen. Some decorative pumpkins are white. One variety of white pumpkin is called Casper, like the ghost. It is often used for decoration. A sugar pumpkin is another variety that is often used for baking pies. It has smooth, orange skin. Happy Jack is a medium-sized variety that is just right for making a jack-o-lantern. 3 Prizewinning giant pumpkins can grow up to several hundred pounds. The Big Max is a jumbo pumpkin variety. Some pumpkins are very small. One variety of these miniature pumpkins is called the Jack B. Little. 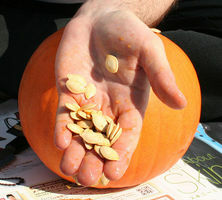 Feedback on How Many Seeds Are In Your Pumpkin?